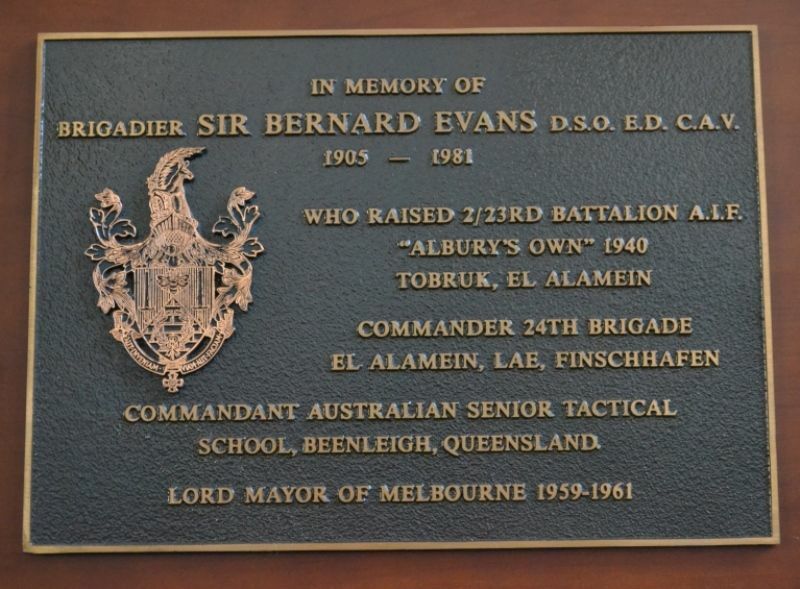 A plaque commemorates Brigadier Sir Bernard Evans D.S.O., E.D., C.A.V. On 1 July 1940 Sir Bernard Evans was appointed to the Australian Imperial Force as a temporary lieutenant colonel and ordered to form and command the 2/23rd Battalion, `Albury’s Own’. He was then the youngest battalion commander in the AIF. Sent to the Middle East, his unit was engaged in the defence of Tobruk, Libya (April-October 1941), where Evans’s `solid leadership and total disregard of personal danger’ were `an inspiration to all ranks’. He was awarded the Distinguished Service Order. Brigadier SIR BERNARD EVANS D.S.O., E.D., C.A.V. Who raised 2/23rd Battalion A.I.F.